I know there are a million articles out there telling you why you should use cast iron to cook with and I'm about to give you another one. My love affair with cast iron started when I read some articles about how awful the nonstick pans are for you. I can't tell you the amount of money we spent on what we 'thought' were high-quality pans just to have them scratched up and flaking junk off in our food within a year's time. 1. Cast iron will last your lifetime, your kid's lifetime, your grandkid's lifetime....should I go on? You get the picture, right? When you invest in cast iron, you are investing in pans that will last your entire lifetime and into future generations. 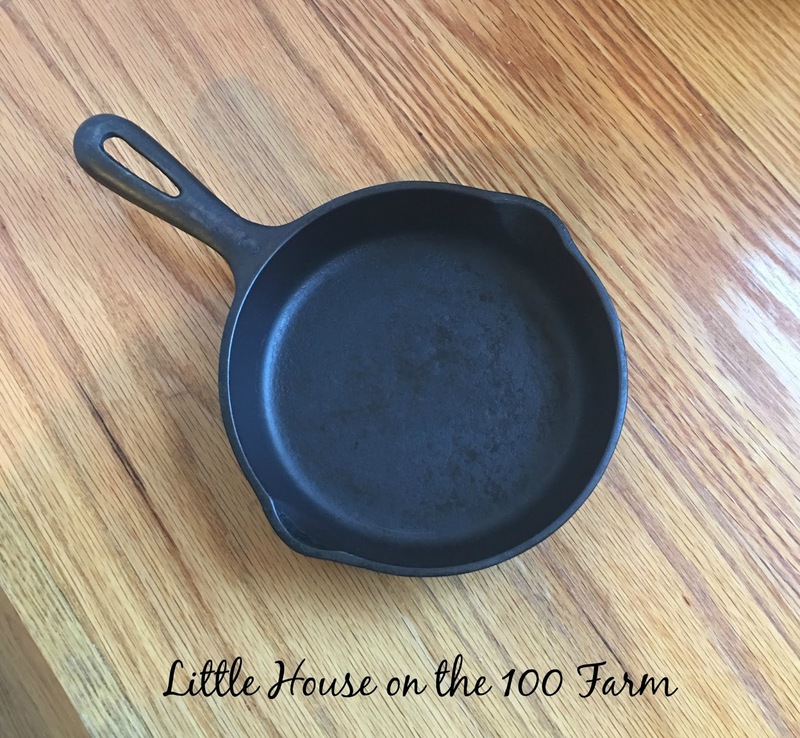 There are antique cast iron pans that people are still using today from the 1800's. I like to picture my great-granddaughter using my cast iron and talking about how this used to be her great-grandma's pan. 2. Cast iron saves you money. If I added up the money we spent yearly on nonstick pans prior to using cast iron, I could have easily bought this set of cast irons pans about three times. In the name of self-sufficiency, it doesn't get better than never having to buy pans again. 3. There are actually health benefits when cooking your food in cast iron. It's called cast IRON which means that cooking with it is going to add iron to your diet. I have a tendency to be borderline anemic and cooking with cast iron is a way to help with that condition. 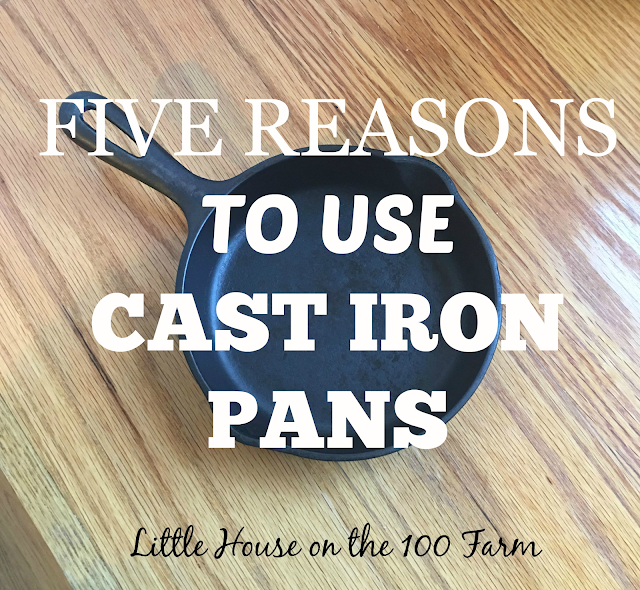 Many women who are still having monthly cycles can benefit from the extra iron provided by cast iron pans. But, the biggest reason to switch to cast iron is to get away from all the synthetic material and chemicals in other types of pans. 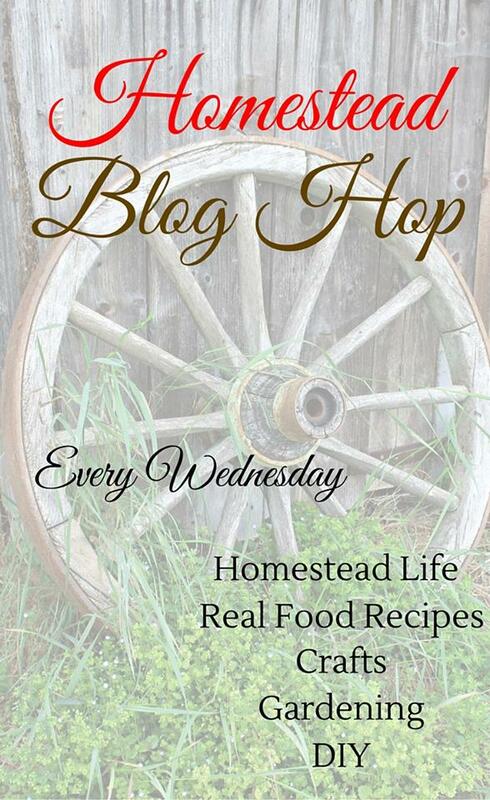 Cast iron and stainless steel are what you should be using if you want to avoid toxins when cooking your food. 4. They are really easy to clean. When I cook an egg in my small egg skillet, I usually clean it by just wiping it out with a towel. That helps to keep it seasoned so your food doesn't stick. If it has a lot of food stuck to it, I will put a small amount water in it and boil the water to get the food unstuck. I then season it really well again. We season all our pans with bacon grease that is strained and collected after cooking bacon. 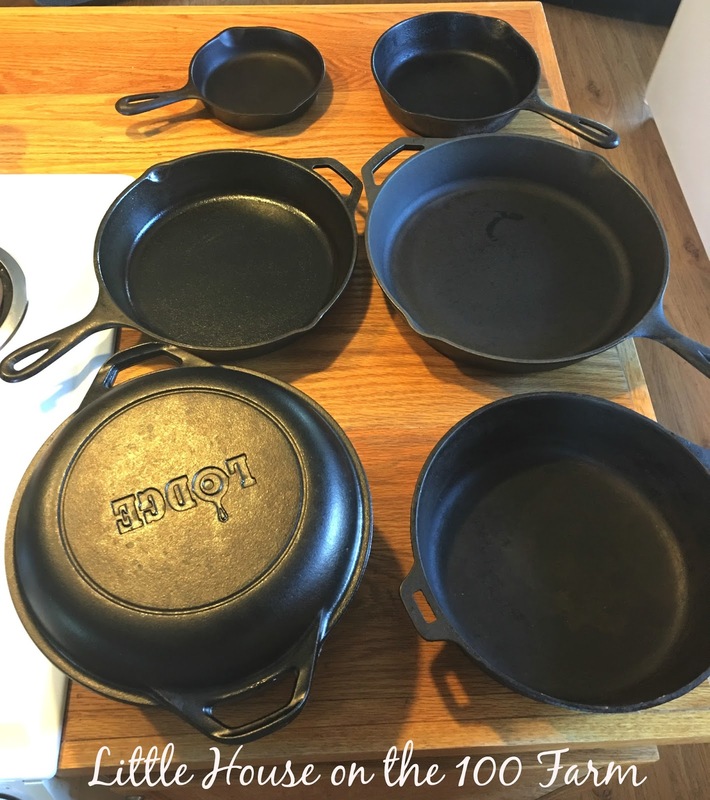 This is my collection of cast iron. Some were purchased by me, some were purchased for me, and some were bought at garage sales. Finding them at garage sales for a reasonable price has become much harder because people want to call them antique and stick an outrageous price on them. Make sure you check on prices. A lot of times you will find a cheaper price on Amazon. 5. Cast iron can go from the stove to the oven. You can use cast iron on your stovetop, in your oven, and even in an open fire. It doesn't get more versatile than that. Taking care of your cast iron may take more time than using other pans, but to me the time is worth the effort. Many people give up on cast iron before they really get the pan good and seasoned. They don't understand the more you cook with it the more it becomes nonstick. Most of our pans are just like nonstick pans now because they have been used so many times. These are my reasons for switching to cast iron. What are yours? I LOVE my cast iron! I used to be so afraid of it because I didn't know how to care for it and always heard all the "DON'T scrub it" and how it rusted, but not that I've figured out how to use it, it's all I use! We got rid of all our "non-stick" pans too. I love mine too. I can't believe all the money we spent on pans before switching to cast iron. I bought two new Lodge pans that were supposedly "pre-seasoned" but most places recommended seasoning them anyway. I did it in our outdoor grill, using lard as the seasoning, following other recommendations on how to do it on the grill. Mine came out thickly covered in black soot and one has rust all over the bottom. The other has areas of rust on the inside. The grill does not leak. 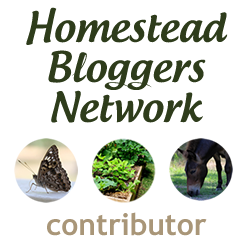 Where did the rust come from ...and the soot? Now I have to scrub them and start over.